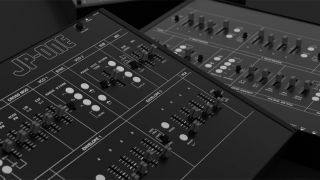 Superbooth 2019: DinSync’s very own Paul Barker has posted up some very tasty videos and images on Instagram, showing the new JP-One synth. The JP-One is a dual VCO monosynth, which has been inspired by the Solo Mode from the Roland Jupiter 6. The unit is powered by two genuine Curtis CEM3340 VCO chips and not clones. This recent batch has been made by Curtis Electromusic with the full blessing of the late Doug Curtis’s family. Also taken from Roland’s Jupiter range is the use of the same discrete transistor OTA chip found in the Jupiter 4’s filter.